We're on vacation in the big city - where anything can happen - and the happily askew font is a promise that jolly times lie ahead! 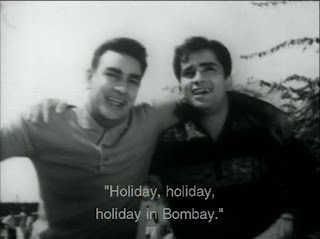 Old friends (or half-brothers, or cousins - I couldn't pin down what their relationship is) Nath (Shashi Kapoor) and Gautam (Rajendra Nath), who are super excited to be in Bombay. 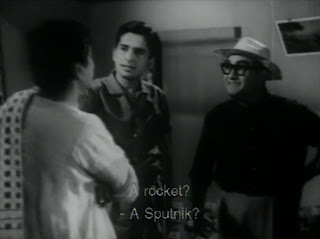 "Yes, boys, I got a rocket. That makes sense." 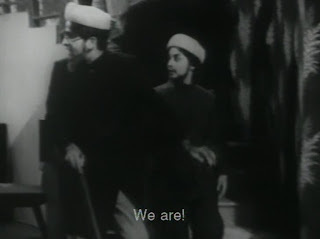 Actually, he's acquired a wife, the funny and spunky Sharda. Sharda likes her husband's friends, and she gets her aunt to help them find a place to stay in the city. 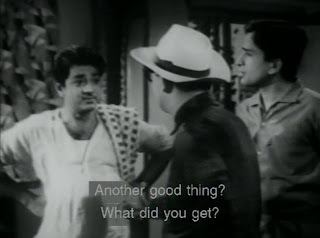 New digs in a chawl, managed by the mean and meddlesome Mr. Hanuman (Dhumal). 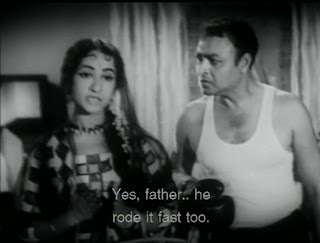 Gautam's is Seema (Naseem Banu), whose father, a boxing enthusiast, will only let her marry a tough guy. 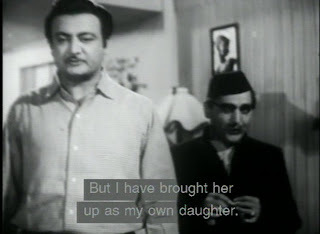 whose guardian, her creepy uncle (Rajan Haksar), has secretly arranged to marry her off to some really age-inappropriate guy so he can take over the inheritance she will gain when she marries. Of course neither boy knows of these impediments, so they quickly fall in love. That's Gautam and Seema on the balcony, being adorable in the park. 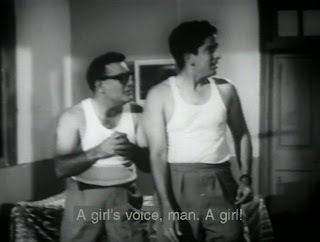 Nath loves Vijaya in a library - or so I infer from the subtitles, because my DVD had a weird skip in it and missed what was surely a cute scene. 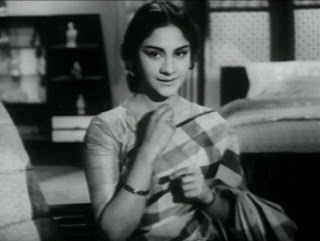 Shashi in a library! Plenty of fake beards, which are necessary components of the disguise-based schemes to work around the impediments to the romances. Don't worry - we get good mileage out of our disguise kits, because bad guys later use them on to try to undo the romances. You're going to need an extra checked bag for all the cuteness in Narayan Dutta's songs! 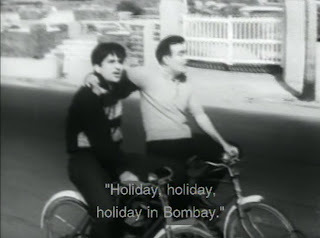 The best one is "Yeh Hasin Bombay," in which Nath and Gautam frolic around Bombay and cavort carelessly on a variety of modes of transportation. 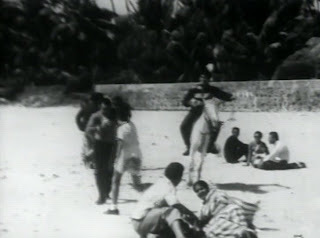 Nath manages woos Vijaya on the beach in "Aaj Yeh Aanchal" despite his ill-fitting polo shirt. 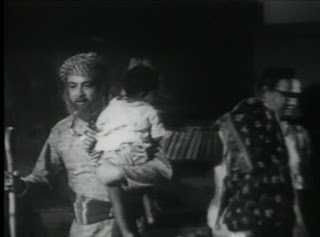 Not one but two songs serenade the chawl: Gautam entertains on the balcony with "Lanat Hai Aisi Mohabbat Pe," and later both boys sing a qawwali ("Raswaare Matwaare Kajraare Nainwa Tihaare") for the youth club. 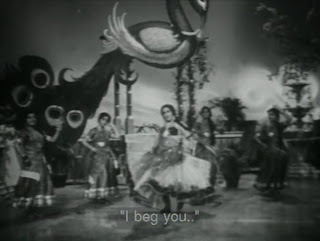 The girls have their own song too - the sad, post-disguise-and-deception-fuelled romantic separation "Pihu Pihu Papihe Na," complete with giant peacock. Side note: the only other giant peacock in a song set that I can think of is the gorgeous "Kannamoochi" in Kandoukondain Kandoukondain, and I love it! Can anyone name some more? 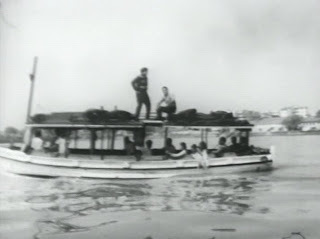 Update to post (March 10, 2009): here's one from Tananam Tananam! 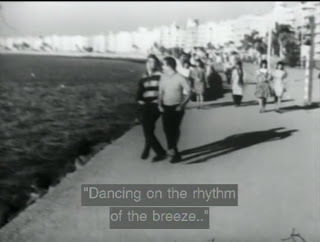 There's even one of those classic "couples go sight-seeing" songs with famous landmarks overlaid with footage of people walking, pointing, and loooking really happy. Ooh, I remember that movie theater! Too bad my photo doesn't have a ghost-Shashi in it. 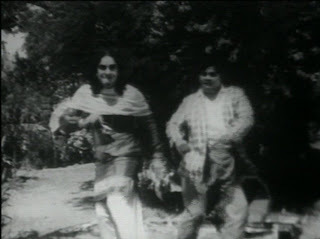 And making its debut appearance in my personal catalog of Hindi films, "The Limbo Song" complete with cow bell and Rajendra Nath in drag! A boatload of cute, that's what! If I hadn't just put "Squeee!" in the title of a post, I'd do it here. To be honest, there's nothing noteworthy in this film except the songs, but the whole thing is adorable and it doesn't really matter what does or doesn't happen. 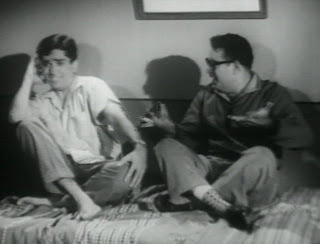 Shashi Kapoor and Rajendra Nath make a really jolly pair, as they did in Raja Saab, and they manage to pull off acting like doofuses without being annoying. 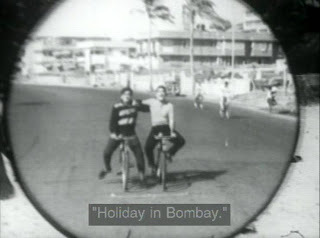 The movie feels a lot like you're watching someone's home video of their 1963 trip to Bombay - the print is fuzzy, the camera goes in and out of focus, and the sound occaisonally disappears. But again, that doesn't matter, because the characters we're supposed to like are funny and sweet, the affectionate relationships (both friends and romantic) are breezy and fun, the bad guys get what they deserve, there's a gigantic rambling fight at the end in which Nath dishooms and Seema accidentally hits Gautam on the head, and all is put right at the end. Pack your bag and go romp around with Shashi! For a moment, when I saw the title of your post on my feed, I thought you were coming to Bombay and I went 'Yay'. I don't even know where you get these films from. I certainly haven't seen it in my video library. But I want to see it. 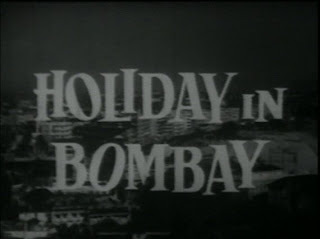 I always love watching Bombay of years and years ago. My parents' time. Empty streets, old cars. This sounds like such a comforting movie to kick back to- low stress, and fun. I'd really like to see this, and play the "ID the landmark" game. 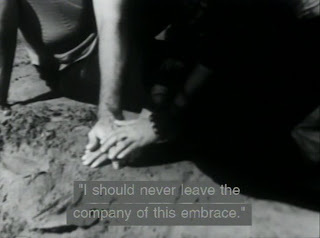 Honestly, I agree w/ Banno- thought u had gone on a impromptu trip! 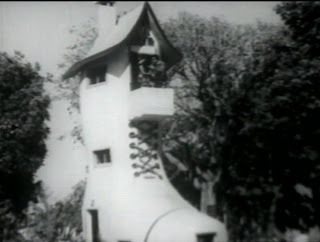 That shoe house is still there in Kamala Nehru Park! 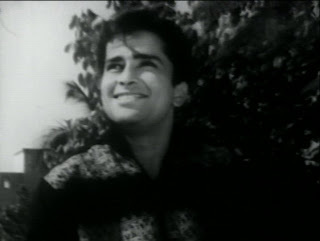 Shashi's crore-rupee smile looks like it's threatening to burn through the celluloid in that one cap. This was such a cute movie - unremarkable but cute. Echoing Banno, where did you dig up a DVD? I found a crappy VCD when I went hunting for this. 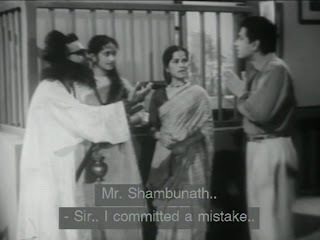 :-( And Shashi doesnt go to the library (research question: WHY didnt he ever do that? ), he just tells his friend that he did, instead of admitting that he was romancing his girl in a park. Why do ppl watchboring movies. Our media is full of garbage. (Generally speaking) in America and India. Pretty incoherent stuff. Have you seen the movie "The Secret". Now that's a movie which is worth your 2 hrs. This is such a sweet movie. And the Vcd isn't all bad, as it skips less than the Dvd. If I remember correctly Vijaya is actually on her way to the library when she meets Nath for the second time, but her plans get derailed and they end up in the park. And Shashi does at least enter a college library in Haseena Maan Jayegi; not that he doing anything library related, he is just there to flirt. 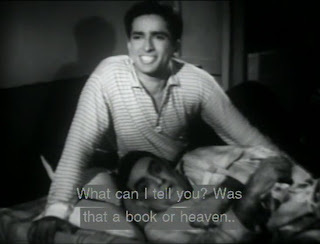 Actually, thinking about it, we only see the spoiled version in the library, the good student Shashi isn't shown there. 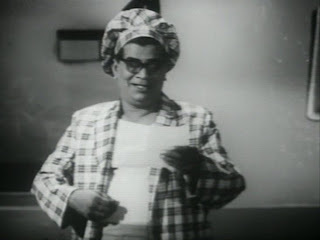 He is also in a library at some point in the much later Sindoor, watching Govinda flirt with Neelam. Hmm, it seems people never do any studying in filmi libraries (or book replacing, or telling people not to eat/drink red bull/ use bottles of ink, or unjam the photocopier). Looks very cute, except poor film quality is beginning to get on my last good nerve. Hadn't even heard of this one, but I like N Dutta's songs generally so will at least look for them! 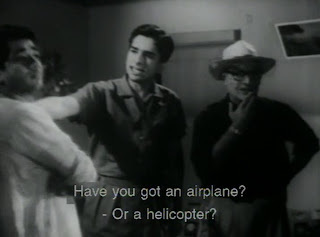 This particular movie came to me via my wonderful friend Celi, founder of the Somewhat Unofficial Shashi Kapoor fanclub on facebook. She got it for £1 at a store called Poundland in the UK. 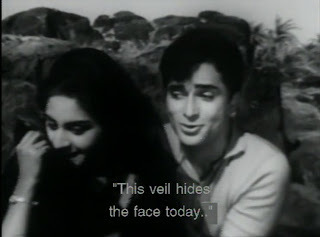 She's got a good eye, because Shashi's name is not listed on the DVD cover, and his photo is not prominent. I am happy to inter-living-room loan this to you! Shweta - Yes, that's it exactly! 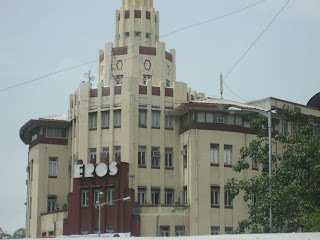 Bawarchi - My biggest sight-seeing regret in Bombay is not seeing that shoe! At least I got to see the penguin trash bins in the Hanging Gardens. PPCC - Behold the smile! It will GET YOU! 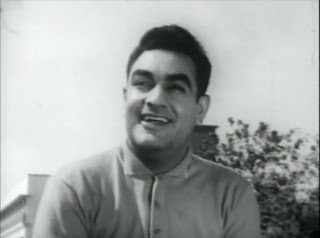 It's kinda hard to believe this movie is the same year as The Householder, in which he is also a gentle soul but in a completely different way and with a completely different attitude. I'm very sad about the library! Nothing against parks, but libraries are more my thing. Anonymous - To each their own; this didn't bore me at all. gebruss - It is so sweet, agreed! HMJ is the only Shashi library I know of, I think, and one does have to make do with the evil look-alike. At least he's not known to be thoroughly evil at that point. Until Thoda Pyaar Thoda Magic I would join your commentary about movie depictions of my workplace, but since I've seen Rani give a tour of sorts, I can hardly complain. Anyone thinking about getting the VCD - apparently it has ads! This looks soooo cute! 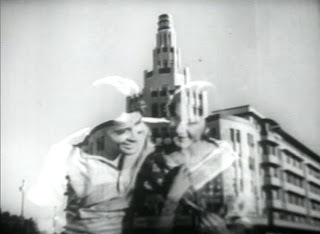 Even the opening titles look cute. I wonder if I can find it?